The B-52 is an 8-engine strategic heavy bomber which has been developed by the American company Boeing for the United States Air Force. The B-52 features itself's by the large sizes, 8 engines (TF-33 low bypass) and no ailerons. The B-52 forms the backbone of the USAF manned strategic bomber force. The first of this huge aircraft was delivered the USAF in 1954. 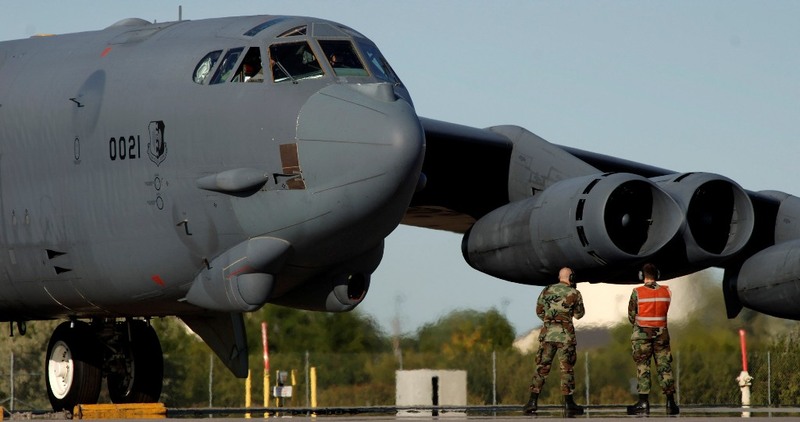 After more then 50 years the B-52 is still operational and the USAF expects to hold them in service till 2040. The B-52 can fly high-subsonic speeds at high altitudes (15km) with the largest arsenal of USAF weapons. As of 2014, the U.S. Air Force has 76x B-52H's operational (58x Air Force and 18x Air Reserve). 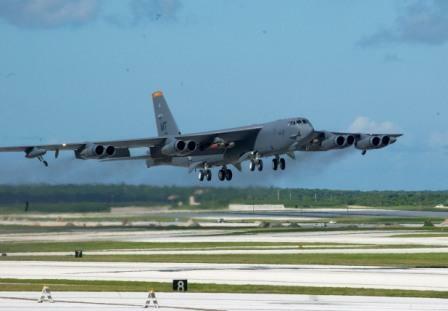 From 2013, the B-52H's will be updated by the Combat Network Communication Technology (CONECT) program which includes new servers, modems, radios, data-links, digital workstations and Link 16. The B-52A was made his first flight in 1954 and the B-52B in 1955. In 1955 the B-52 was being delivered to the US Air Force. In 1966 the first 102 B-52H bombers were delivered to the USAF. There have been build 744 aircraft with the last, the B-25H delivered in 1966. Now a day, only the H version is still operational. The B-52H's are assigned to the Air Combat Command of the USAF which has 58 aircraft and the US Air reserve 18. The B-52 is capable of dropping the widest array of USAF weapons, up to 70.000 pounds of intern and extern weapons. It can be equipped with precision guided ordnance bombs up to 2000 pound ammunition, mines and missiles (modified to launch 20 cruise missiles). 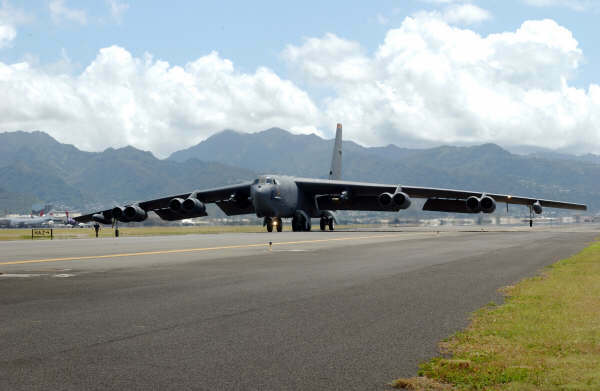 Thanks to be able of dropping mines the B-52 is capable of assisting the U.S. Navy in mine-laying operations. However it can also be used for anti-ship missions. One of the bombs the B-52 can drop is JDAM which is one of the newest and most advanced bombs in the US Air Force arsenal. For low-flying the B-52 is equipped with a special electro-optical viewer system. After 1989 all B-52 have been equipped with GPS. For night operations there can be used night vision goggles. By conventional conflicts the B-52 can also be used for strategic attack and maritime operations. With the giant overpower the B-52 can be used for psychological warfare. This is used in Operation Iraqi Freedom. but mostly in Operation Enduring freedom. 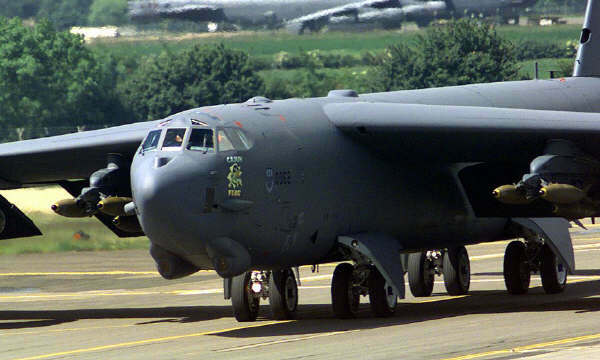 The B-52 was also used during Operations Desert Storm, Operation Allied Force and the first Gulf War. During the first Gulf war the B-52's destroyed wide-area troop concentrations, fixed installations, bunkers and decimated the morale of the Iraq's Republican Guard. During Operation Allied Force the B-52's opened the conflict with conventional missile attacks and dropped then purpose bombs and cluster bombs on Serbian Army positions and staging areas. 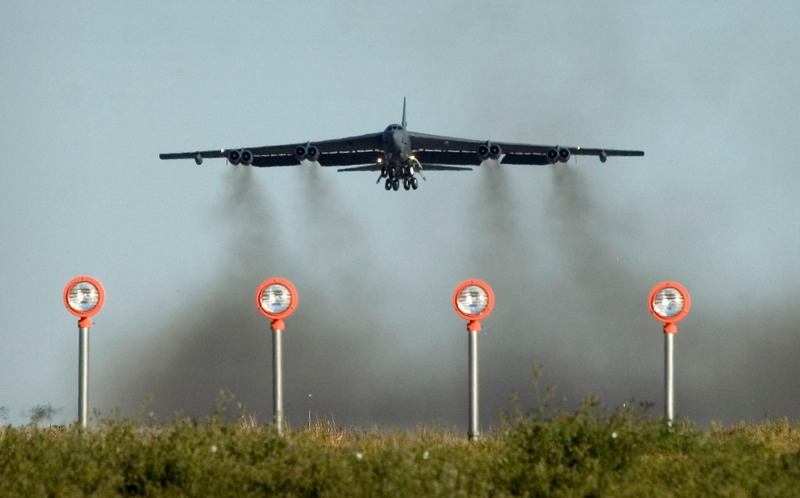 The B-52 can fly high subsonic speeds and has a ceiling of more than 15Km (49,212 ft).